Our lives would be so much easier if we just didn’t have to have “the talk”. Some of us have made dodging difficult conversations an art form while others dive into them like a bull in a china shop. There is no easy way of having a conversation with someone that may very well hurt their feelings, put them on the defensive, or make you feel uncomfortable. However, depending on our approach, hard conversations with others can actually lead to personal breakthroughs, mutual understandings, and can even strengthen the relationship rather than destroy it. ’m a natural girl through and through. I love earth tones, subdued colors, being near water, and walks through nature. Whenever I shop, I choose neutral colors so they’ll easily blend in. Even my home décor reigns of beige, browns, and taupe colors. But there is something that makes me feel saucy and a little bit fiery, whenever I wear red nail polish. My hand gestures become grander while speaking, there is an extra sashay in my stride, and I feel that much more confident. Disclaimer: Today’s post is a long one. The purpose-passion conversation can be a loaded one so I’ve divided this post into two parts. Ready? Let’s go. There’s nothing I love more than an enriching conversation on the fascinations of exploring our purpose on this earth and the passions we discover along the way. What I am noticing is that when it comes to the word ‘purpose’ some of us either shy away from using the term, some of us avoid it all together, and some of us haven’t really stopped to explore what living it really means to us. So what I’d like to do with you here today is take a step back and open up a dialogue about the word ‘purpose’ and our perception of it. We’ll also talk about our passions. Some of us know what our passions are and excitedly live it every day. Some of us may find it intimidating or even mysterious as we question it and look ferociously to find it. And some of us are actively immersed in exploring our passions and allowing it to be revealed day by day. No matter where you’re at on the purpose-passion continuum, we’re going to do a bit of exploring some food for thought today. I came across this powerful little word just recently while scrolling through my Facebook newsfeed. A photographer who recently photographed a wedding used the word ‘honor’ in her photo caption. If I recall, her words were, “it was such an honor to capture their special day”. I locked in on this word, honor, because something about the way she used it caught my attention. Her use of the word ‘honor’ caused me to imagine how it must have felt for her to do the work she did for her clients in capturing their wedding day. I’ve had my play in the photography world for a time so I do know what a tremendous honor it is to be chosen by your clients and valued for your talents. However, I will venture to say, that the honor this photographer felt in doing this work for her wedding clients didn’t just come from being chosen for her talentedly-made photographs. So simple. So effective. So powerful. You ever find yourself in a whirlwind of self-talk that just will not stop? In just a moment of time you’ve taken yourself down a rabbit hole filled with incessant mind chatter, pulling you farther and deeper away from the present reality. It can leave you feeling paralyzed, indecisive, and downright lousy. We’ve all been there. Some of us vacation in the land of self-sabotage and many of us live there 24/7. Can I get an amen? Imagine for a moment that when you feel yourself being whisked away by all the self-talk, you simply said to yourself: “PAUSE”. 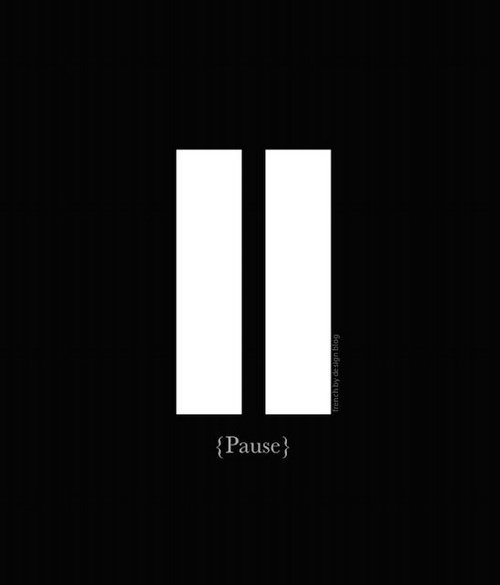 PAUSE injects a silent space that allows you to tune into your body and interrupt the pattern of distracting thoughts. It is a conscious decisive action that you can take in the moment, in real time that can bring you back to the present moment and back in your power. When you’re self-sabotaging thoughts get the best of you, bring in the silent power of PAUSE. The subtle yet powerful shifts you’ll experience will amaze you. Try it this week! Keep me posted on how it goes….ariane@arianehunter.com. Before the start of the new year I spoke at a women's professional organization and met a group of 22 passionate dedicated women who are taking control of their careers and making their goals a reality this year. I spoke about my 10 tips for the career conscious professional and thought I'd share it with you here to support you in your career journey. So over the course of the next 3 posts, you'll receive my tips for aligning your career with your personal purpose. Here we go! When you say yes to pursue your dream career, it is part of the process to go through hardships. It requires courage, discipline, fortitude, sleepless nights, rejections, and falling flat on your face. But the fulfillment and personal satisfaction you gain in the process is priceless. Saying yes is a commitment to align with your career purpose. You are taking steps to improve and be better than when you first started. Get clear on what you want to achieve in your career and why that is important to you. This is a highly personalized process and will ground you in your values, purpose, and vision. Without clarity, we float aimlessly and spend our energies in different directions that cause us to lose focus. When getting clear, be imaginative, creative, detailed, and willing to exceed your own expectations of what you believe is possible. I hope you practice these well. Til next time when I share part 2 of my three-week career tip series! Around 12:30am in the morning to be exact. You spent the last 12 hours lamenting at how your colleague has not responded to your email about the pending deadline for a very important project. You’re upset at his lack of response and how he does not understand how important this is. For him to just blatantly not respond to YOUR email about this very important question, he must not care. He doesn’t care about you, he doesn’t care about the team, and he just doesn’t get it. How dare he, you think to yourself. You resolve that when you see him tomorrow morning, you’re going to give him a piece of your mind. You know that he will be full of excuses as to why he never responded but you’re so sick and tired of it, you don’t want to hear it. You begin rehearsing all of the things you’re going to say to him like calling him selfish, not a team player, and caught up in his own world. You even begin thinking about how maybe you don’t want to work with him any more and that you should even tell him that. You go to bed that night with all of this on your mind. You find yourself prepping for battle. The next morning you see your colleague as you storm up to him ready to give him a piece of your mind. You notice he has a solemn look on his face that stops you dead in your tracks. Before you could even ask him what’s wrong, he tells you his wife is in the hospital. You suddenly forget every razor sharp word you were going to say to him and give him a long compassionate hug instead. What happens when we prep for battle? Our mind is consumed with distracting thoughts that cause us to get angry, frustrated, and blame others for things not going the way we want. We concoct stories of how the other person is at fault as we position ourselves to be “right” and win whatever the conflict is. We lose our sense of the big picture because we are only focused on one version of the truth: our own. I am right and they are wrong. In this mindset, we are not open to other possibilities of what else may truly be going on, just the stories in our heads. And based on that truth, we’re willing to engage in battle with the world and ourselves. When you find yourself falling into blaming others for something gone wrong and that you need to prove yourself right, recognize that the battle is all in your mind. Challenge yourself by asking, “what else may be going on here? What am I not seeing?” By just asking yourself these 2 simple questions puts some space between your reactive thoughts and the resulting action. Be willing to see other possibilities as you expand your thinking outside of yourself. What situation lately has gotten you so riled up and ready to go to battle? What if the battle in your mind didn’t have to translate to a war with your colleague? Be willing to see the bigger picture.